Neha Gandhi is a media executive with 15 years in the lifestyle and fashion industries. She is currently the Editor in Chief and Chief Operations Officer at Girlboss, a role for which she moved to Los Angeles just over a year ago. Prior this this, she lived in New York City, where she worked as a writer, editor and in development for print and online media like Harper’s Bazaar, Refinery29 and Instyle. NEHA GANDHI: At my core, I’m a journalist and storyteller. Along the way - in a career working as a writer and editor at magazines from Instyle to Harper’s Bazaar to Seventeen, and then managing editorial teams and then growth teams at Refinery29 - I picked up a love for building and leading teams. Those are probably the three things I’m best at: writing and editing and managing teams, helping people grow and develop. Tell us about what you do and how you do it? I’m the editor in chief and COO at Girlboss, a community built to help women define - and redefine - success on their own terms. I oversee operations, culture, content, growth (and more) and get to work with an amazing team of women (and two men!) dreaming up ways to provide women with tools and resources to get smarter about money, about their careers, about leadership and management, about their wellbeing and about the world around us. What’s the top priority on your agenda these days? Right now, I’m pretty focused on making sure our next conference is going to be a huge success. If you’re in NYC this fall, you can find us at the Girlboss Rally in Brooklyn on November 17 and 18. We’ll have amazing women from Bozoma Saint John to Arianna Huffington to Elaine Welteroth speaking, with two full days of programming, headshots, networking opps and some really amazing workshops where you can learn about everything from brand-building to negotiation. This is our fourth rally to date, and I’m pretty confident that it’s going to be our best one yet. Neha Gandhi with Bozoma St. John at the Los Anglese Girlboss Rally. Photo by Isabella Behravan. 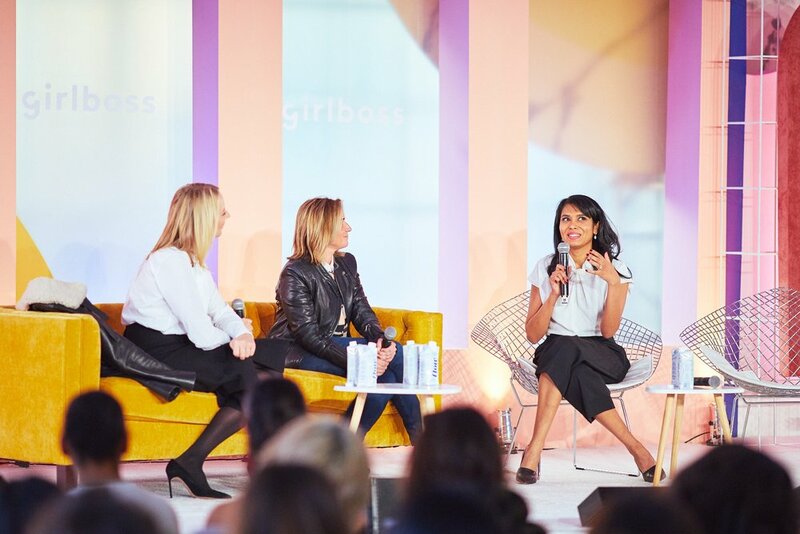 Neha Gandhi with Bozoma St. John at the Los Angeles Girlboss Rally. Photo by Isabella Behravan. Future projects on the horizon? We’re building a subscription platform that’s all about community. If our goal is to help women redefine success for themselves, then a huge piece of that is about helping them connect to each other. So, we’re building a private social network that’s a space where women can share who they really are - both professionally and personally - and support each other, advise each other, lift each other up, and share their wisdom with each other. We’ve been working so hard on this with a tiny but mighty team of just a few engineers and one product designer. I’m so excited for women to start experiencing it. If you want a sneak peek, sign up for the wait list at collective.girlboss.com. What are your thoughts on feminism and empowerment? Extremely pro. It’s a weird time for women - in the U.S. for sure, but really, across the globe. Women’s voices are being silenced in ways big and small; women’s anger is being dismissed as hysteria; women’s fundamental rights to make decisions about their own bodies are being challenged. And that’s in the parts of the world where women are living under the pretext of equality. There are other places where that’s not even an expectation. And to me, that’s what feminism is. Not the pretext of equality but the actualization of it. It’s the freedom to make your own choices about the fundamental, tangible things as well as the more ephemeral ones. We have to fight for that until we’re worn out and exhausted - and we have to support each other at that point, so that we can keep fighting some more. There’s a lot of work to be done here, and none if it is going to be easy. The power of female community. This is a little cheesy, but the idea that we really are stronger together, when our voices join together, is life-giving. We have to amplify each other - not just other women who look like us and come from similar backgrounds. More importantly, we have to amplify the voices of women who have less power in our culture than each of us does, women who are silenced and disenfranchised and overlooked. That’s how each of us should be using the power that we do have. Who do you admire? Who are your teachers? Stacey Abrams, who recently won the Democratic party nomination for the governorship of Georgia, my home state. She's the first black woman ever to do that, and a fair, thoughtful, intelligent, action-oriented leader who I'm so inspired by. Nora Ephron, for being a brilliant storyteller - and for teaching me so much of what I know about the women's movement of the '70s, through her words. And of course my mom, Prema Gandhi, who raised three kids in a foreign home, as a relatively recent immigrant to this country. And then, in a second act, found her home in the professional world in the past decade - as both a tax preparer and a teacher of Hindi at Emory University. She's even started her own non-profit Hindi school for young kids in those years. It's been incredible to watch. My husband does. He’s an incredible partner, and having that person in my life who will move across the country with me because I want to take a leap on a new job and listen to me and fill the gaps of the community we left behind in NYC, it’s a really special thing. One thing I’m particularly focused on right now is, well, finding focus. It’s easy to check mundane things off a list for the thrill of the checkmark. It’s easy to feel overwhelmed by all the possibility a business like ours sees ahead (and all the work that accompanies that possibility). And it’s easy to bite of more than you can chew when you are working at a startup. The only thing that can save me from all of that is the ability to think clearly, to prioritize ruthlessly and to focus. In a culture where we have digital access to everyone and everything and can see the best parts of another person’s life at any given time, that’s hard to do. But I’m working on it. What kind of investors does Girlboss have? Any women? There’s something amazing about looking around at our board meetings and seeing mostly women. It’s the only time I’ve ever experienced such a thing and it honestly fills me with a sense of power that’s foreign and amazing. We have our two lead investors - Lightspeed and Initialized - represented, and both seats are filled by women who are brilliant and insightful and so helpful. I feel so grateful for it. Any advice to women founders and entrepreneurs? Brag a little bit, and then brag a lot more. Swing for the fences, and confidently tell your investors and the press and anyone else who will listen how big your idea is going to be - how much potential it has. Obviously, do the work, and all of this layers on top. But I do find that women are less likely to walk in with the type of bravado investors are used to - and they are punished for it. There are a lot of institutional reasons why only 2.2% of venture dollars go to female-founded companies in the U.S., and we have to demand that institutions change and perceptions shift and VCs stop asking women more negative questions than men (really! ), but this is one real thing we all can and should do for ourselves as well. Neha Gandhi with Linda Wells and Debra Curtis at the New York Girlboss Rally. Courtesy of Neha Gandhi. Tell us about your management style. I’ve been told my management style is nurturing. I’ve seen that hurled as an insult or suggested as an opportunity for improvement, but over time, I’ve come to see that it’s actually my superpower. I lead by guiding and helping the people who work for me grow and develop and learn. I believe that that’s my responsibility to them. I also think you get a lot more done if people are motivated by a desire not to disappoint you rather than by fear. And that’s how I think about building relationships with my reports, and how I think about setting goals and expectations. Do you find that the way women define success is evolving? If so, how? What’s most interesting to me talking to women in the Girlboss community is that success can mean myriad different things to them - and it’s a moving target, as with all of us - but they really do think of it, and think of their lives, much more holistically. This generation doesn’t want to separate their personal and professional lives; their ambitions and their wellbeing. They want to think about all of that as one integrated concept. And it’s really smart. Balance is a phantom you can chase forever and never inhabit. But integration of the different elements of your life in a way that fits your needs? That’s achievable. After a decade in New York City, you moved to Los Angeles last year. How do you like your new home? Anything you had trouble accommodating to? What’s new or different there? Moving to LA was really great for my general wellbeing. I sleep better out here. I never fully adjusted off eastern time, and that's how I tricked my body into feeling like I'm a morning person. So now I go to bed around 1030pm, am asleep by 11pm, and get up around 630am, which means I get almost a full 8 hours of really good sleep. I don't think I've ever felt as rested in my life, truthfully. That’s the great stuff. On the other hand, moving to a new place after 13 years of building a community on the other side of the country is...hard. My closest friends and the people I normally turn to for support, to vent, to combat loneliness - they live across the country now. I have been in LA for a year, but building real community takes a long time. I definitely have met some amazing people in this past year (shout out to my brunch club filled with amazing women in media), but I don’t have the same thing I had in NYC. I’m trying to be patient, though. I’m all about building routine around wellness and fitness. I’m a newbie at meditation, but I’m trying really hard to do it each morning for a few minutes. I love the free guided meditations UCLA offers here. Less routine, but just as amazing: acupuncture. This always feels like a physical reset for me. I carry what feels like 100% of my stress in my shoulders (and obviously sitting at a desk all day doesn't help), but every time I go to acupuncture, I feel a relief that I don't get from anything else. And then, I'm a vegetarian, so my primary focus with food is usually just that I get enough protein and iron. I try to scale back on coffee where and when I can, but I'm pretty much unsuccessful at it. But I do limit myself to cutting caffeine off at 230pm. Otherwise I have trouble sleeping. Ultimately, my rules with food are...sparse. I try not to limit myself from the things that I want, but stick with moderation with it comes to starches, processed foods, and cholesterol-rich foods. Do you ever ‘fall off the wellness wagon’? If so, what does this mean to you? If not, how do you avoid temptation? Definitely. I kind of think anyone who says they don’t...is lying? Ultimately, I love the endorphin rush and clarity of mind that comes with running. It feels like the only time that feels truly internally focused in my day and is really therapeutic, and that’s what keeps me coming back to it. But I also have joints that are aging a little faster than the rest of me, so I have to be careful with my knees these days. Plus, working at a startup and living in a new city means that the days can get really busy and sometimes I can’t make enough time for a workout. I try to cut myself slack for that, because I don’t ever want working out to feel like a punishment. What podcasts would you recommend to our community? I’m of course a big fan of Girlboss Radio - we’ve had some of the most amazing guests on the show, from Roxane Gay to Sarah Jessica Parker to Arlan Hamilton to Ibtihaj Muhammad, and they have the most interesting journeys we can all learn so much from. I also listen to The NYTimes’ The Daily every day. And I love Reid Hoffman’s Masters of Scale. Oh, and the newest podcast on the Girlboss Radio network is called In Progress; it’s all about finding purpose, living with meaning, and just recognizing that the journey is so much more than the destination. It’s so inspiring! Do you have a ‘power’ song? It’s not an upbeat ‘power’ song, but one of my favorite focus songs is Every Time The Sun Comes Up by Sharon Van Etten. I love the quality of her voice, the lilting melody and all the emotion in it. It makes me feel something but also feel at peace, which is the ideal mind frame for focus. What role does travel play in your life? Where have you been and what’s next? Travel is one of the most amazing luxuries in my life. It’s the place where I’m most willing to spend money, and something that helps me feel connected to the broader world, and also really allows me to disconnect from the daily stressors and considerations in my life. About three years ago, I took more than one consecutive week off work for the first time since I started working. And I understood the magic of the way Europeans think about leisure time and vacation. You really need that first week to settle out of work mode and into leisure time. And then with that second week, you can really go deeper with yourself and experience something transformative. Some of my favorite trips I’ve ever taken have included: hiking a glacier in Iceland, staying in the jungles of the Kinabatangan River in Borneo, sleeping on an empty beach in St. Barts, and going on safari in South Africa. High on my list, looking ahead: Going back to Japan to see more than Tokyo, visiting Hawaii for the first time (it’s so close to LA and I can’t believe we haven’t been yet!) and exploring Oman. Neha Gandhi by Crystal Ung. At my best, I let myself feel it. I let myself experience the sorrow, anxiety, fear or disappointment that comes with tough moments. Because when I don’t, it gets buried and leaves me with this dull sense of unease that starts to eat at me slowly. Reading a great book, in hardcover, thumbing through the pages, absorbing another person’s ideas and storytelling magic. Right now, I have John Carreyrou’s Bad Blood, Sally Field’s In Pieces, Joan Juliet Buck’s The Price of Illusion and Dolly Chugh’s The Person You Mean To Be on my nightstand. A desire, a wish, an intention or manifestation? Let’s stop talking past each other and start hearing one another - start treating each other as human beings, as equals, as people worthy of the respect of being heard, believed, seen, and understood. No matter our gender, our ethnicity, our race, our earning potential, our immigration status or our sexual preferences. That feels like a big ask, looking around from where I sit today. But imagine what the world might be like if that were the case. Sign up for the Girlboss email. I send an editor’s letter once or twice each month. And then, you can find me on Instagram and Twitter. And IRL you can find me at Girlboss HQ in Silver Lake, at the Larchmont farmers’ market, walking around Hancock Park, and wandering Soho or Carroll Gardens in NYC.